Month six of my dreadlocks fall 2003. I’ve been growing my dreadlocks for the past eight years. I say dreadlocks, because to me they’re more than a hairstyle or some fad being embraced by a particular new wave of black women who are sporting natural tresses as the “in-thing.” My dreadlocks are somehow entwined with my spirituality, my attitude, much of who I am. I’ve heard many women say they started locks because they were having problems with relaxed hair. That wasn’t the case for me. In the 12 years I wore my hair relaxed, I never had any issues. In fact, I’ve always had a healthy head of hair whether worn long or short. I’d dreamt about having dreadlocks years before I would even begin the process. From my early teenage years when my hair was still natural, I’d approached my mother on the subject. 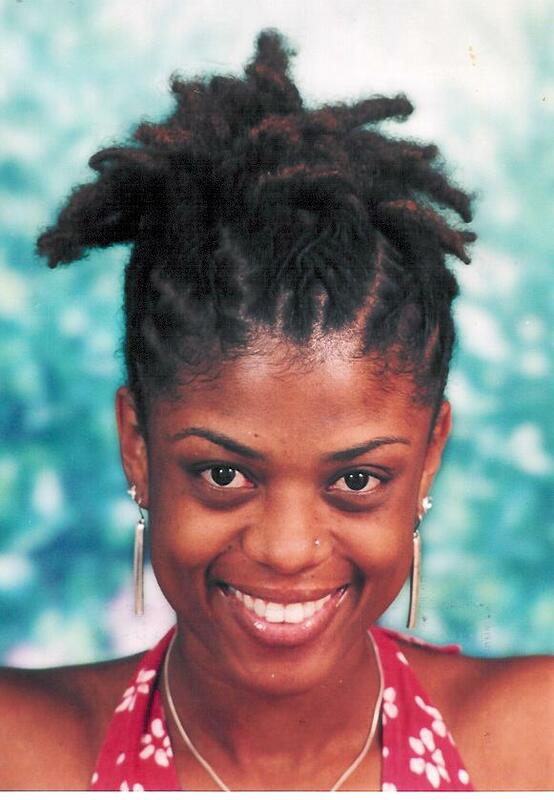 Back then in the Caribbean there was a certain taboo with the hairstyle. Dreadlocks were inextricably linked to the Rastafarian movement that popularized them and unfortunately within the Barbadian society at the time, there was some negative stigma to being Rasta. My mother wouldn’t hear of it. The year I turned 15, my godmother took me to a top male stylist in our capital Bridgetown and I got my first relaxed hair do. For a while I liked it. But by the time I was ready to graduate secondary school, I wanted to get rid of it. So much so, that I chopped off almost all of my shoulder-length hair into what was hottest do of the day – “The Toni Braxton” look. It was this hairstyle that preserved my tolerance for relaxed hair. Everyone loved the look on me and the compliments ensured I kept it for at least three years. Such was the big issue with a non-Rastafarian trying to wear dreads in a newsroom in Barbados. We had one person on staff that was Rasta and to my recollection; there was also a British/Barbadian editor who was starting the dreadlocks process – without protest from management. I was a lowly reporter, so I didn’t push the issue. A few years later when I was no longer with that company and had already moved to NY, I returned home for a vacation and ran into that “very senior.” He had just remarried and I was introduced to his beautiful young wife – she had some lovely dreadlocks. Year five of my dreadlocks. Last Christmas I went home for the holidays and stopped by a couple of the media houses to look up some of my former colleagues. I was amazed and delighted at the number of women wearing locks in the newsroom. In fact, in Barbados as a whole, there seems to be an increasingly high number of women with dreadlocks and for many talented lockticians, maintaining the do has become a thriving business. I’ve developed certain pet peeves for the following questions. Answer: Of course I wash my hair, you numbskull (is what I really feel like saying), but I instead usually answer, “yes” with a smile. Just because one’s hair is natural, doesn’t mean washing it is or should be taken for granted. I’d argue that maintaining healthy natural hair requires more dedication than with relaxed hair. Answer: Do these people also walk around asking this question of those with relaxed hair? Stupse. Do they think I have a timeline for a particular length I’m aiming for or a specific age at which I’ll put a pair of scissors to my dreads? Stupse. I don’t know if or when I’ll cut my hair; let me check the crystal ball and let you know. 3. My favorite question: “You smoke weed, don’t you? Don’t people with dreads smoke weed? Answer: No, I don’t blaze up, burn trees, not 420 friendly or any other jargon affiliated with smoking weed. I don’t smoke period; and never once have I. 4. Most baffling question: I wonder how this truly helps the inquirer, “How long have you been growing your hair? Answer: I could understand if you also have locks, but if you don’t, in what perspective are you holding the response? Answer: I take issue with this because of all the love and nurturing I put into starting my locks from “scratch.” When I finally decided I was ready, I awoke one day, went to my stylist and asked her to cut off all my relaxed hair. I wanted to embrace my own natural hair, to really learn and understand it, to appreciate it and to just enjoy it. I went through the phase of it being fuzzy and looking unkempt as the bulbs (early stages of locks) formed. Due to the soft texture of my hair, it took a full year before the locks started to bond. There were many frustrating moments where I wondered if I’d ever really have dreadlocks. But never once did I consider cutting them. I relished the discipline of caring for them as I watched my “babies” slowly become sturdy coils. They’ve taught me patience and somehow instilled a lovely carefree feeling in me. And over the years, I’ve continued to shower them with TLC, as they remain healthy, grow longer, stronger, and are now a beautiful and a vital part of me. By now, you’ve realized I love my hair. Even if you don’t like dreadlocks, kindly respect my journey with them. Stop asking me those aforementioned foolish questions. Yes, I love my dreadlocks and I wear this crown with pride. Yep, I love my dreadlocks and have no plans to cut them any time soon. Your hair is gorgeous, Sis! I love the style in your Twitter profile. Wow. Even before I cut my hair, I didn’t get those types of rude questions. It was usually Caucasian folks asking if/how I washed it. The most ignorant comments actually came from family members, if you can believe. Your hair always looks nice and healthy! Girl, there are even more questions I didn’t include lol! It must been quite a while since I saw you; didn’t know you cut your hair! As one trying to navigate the ranks in Corporate America, I have been subjected to the many questions as well. The best yet however was related to the shell I wear in my hair. The shell has been in since my hair was an inch long and now it sits past my shoulders. I was once stopped by someone in the office who was attempting to take the chewing gum out of my hair…..hmmmm ….. HELLLOOOOOOO!!!!! Your posts are always really well written. Love your blog Sis!!!! Wow @ chewing gum! Yo bro, I don’t know if to laugh of just smdh! First off, the stranger trying to put their unsolicited fingers on my crown is a big hell no, far more the notion that that I’m walking around with “gum” in it for years! That calls fro some good ole time “discipline” lol! There are even more questions I’m asked or assumptions made but on a good day, I laugh ’em off! Again I share the same sentiments and its really irritating especially when the comments and queries come from the weave queens of Black America. To be honest I am a bit more tolerant when those of the caucasian persuasion ask about my hair. (I just put it down to pure ignorance). But when my brothers and sisters question me about my hair, all I want to tell them is read a book. Learn about yourself. I had a friend in Barbados tell me once, “I could never go natural, because when you dress formally, you don’t look complete”. I took the greatest offense to that. But today that same young lady has locks down her back. I just smile and wave. Love your hair, ladies. Embrace your heritage. Like you, I’m also more tolerant with non-blacks asking about dreads. Funny thing is, they’re the ones more likely to read up etc on dreadlocks once they’ve started the conversation with you, so they have a better understanding. In fact, I’ve had one or two of my non-black friends read about the hairstyle and then ask me for confirmation. I love the “sincerity” in their questions. But some of my “brothas” and “sistahs” ought to know better with some of the questions the ask. Like, seriously? Lol! I get the sweetest older ladies wanting to touch my hair, and asking how I wash it etc. They ask so I tell them. Men, esp white men love locks on black women. Black men either ignore or hate lol. Thank you kindly! One love. I hope this isn’t a stupid question; but when you said it took you a full year before your locks fully bonded, does that mean that you didn’t twist them to form the dreads, you just let them grow like that on their own? I’m thinking about getting faux locs because, I really want dreads but I am still scared to fully commit, so I apologize if its a stupid question, I’m not too familiar with the terminology. I’ve been natural all my life, but I always wore my hair in buns cause I never really knew how to manage my big, thick curly hair. Thanks for visiting, reading and your question. With regarding to my comment about my hair taking a full year to bond, I meant it took that amount of time for my hair to actually “bond” together, as in for the locks to actually form. (That’s the stage that generally considered “the bulbing stage.”) My hair is of that soft, fuzzy texture so the locks took longer to form/start bulbing than someone’s with really tight curls. I started my dreadlocks from spring curls and retwisted (and still do) via the palm roll method. No free forming locks or bongo dreads for me lol!